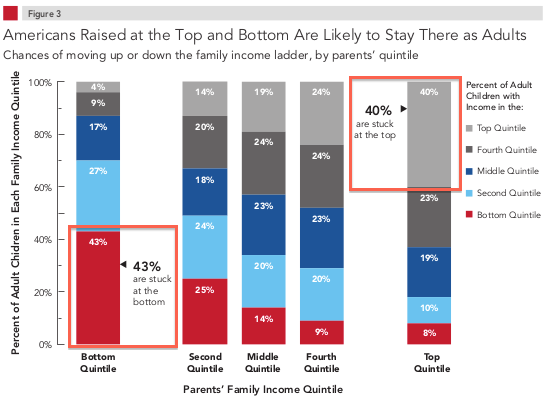 Among media, political, and public claims driving calls for education reform, two beliefs are dominant: (i) education is the single most important lever for lifting anyone above the circumstances of her/his birth, and (ii) teacher quality is the single greatest factor in whether that educational experience accomplishes the first belief. As I have increased my contribution to public debates about education reform, I have witnessed that media, political, and public comments are often knee-jerk and simplistic either/or responses to complex research. But I have also discovered that in my education courses, students challenge many research-based conclusions, although the students are more thoughtful—particularly when I share the evidence on the impact of education and teachers . Consider the follow body of evidence below; and then, in the context of this evidence, I want to unpack what education and teacher impact actually entails. We see here two important points: (i) out-of-school factors dwarf measurable influences of teacher quality, and (ii) teacher quality is a subset of school quality. Thus, school and teacher quality is not even close to the most important measurable factor in student achievement. 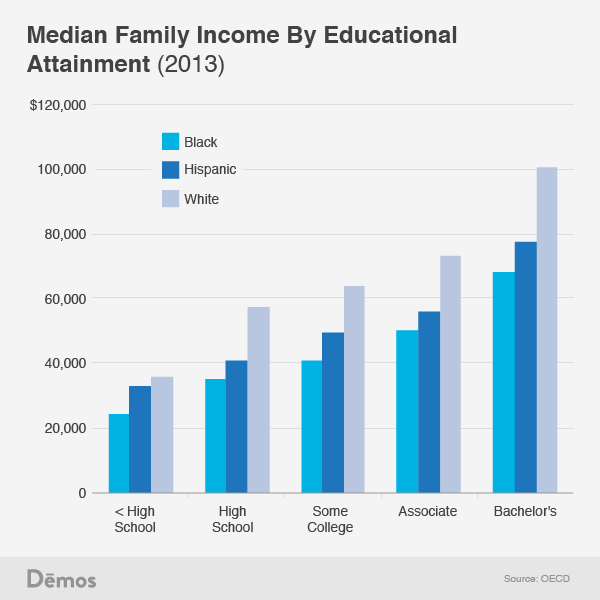 Now, what is the evidence on social mobility in the U.S., notably in terms of how educational attainment influences the relationship between social class or race and that mobility? 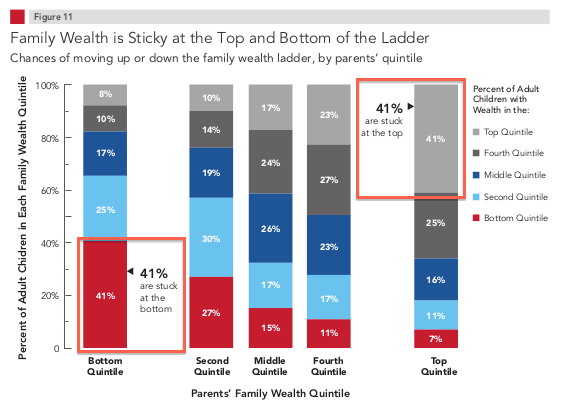 One convenient way to describe what’s going on is that rich kids are more likely to get a better education, which translates into being richer and wealthier as adults. 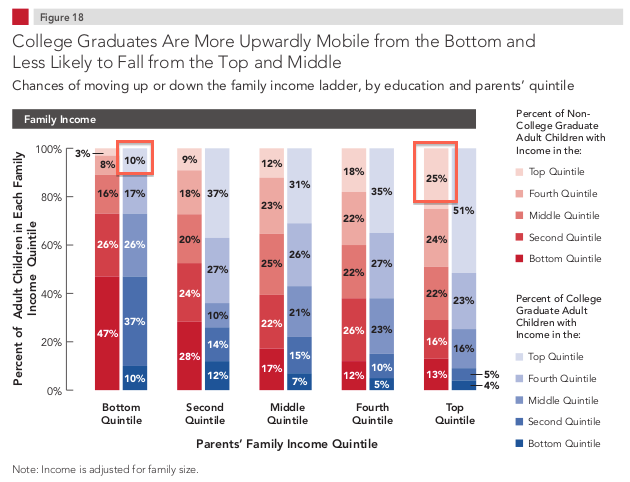 It is certainly the case that richer kids are more likely to get a college degree, and it is certainly the case that getting a college degree leaves you much better off on average than not getting one. 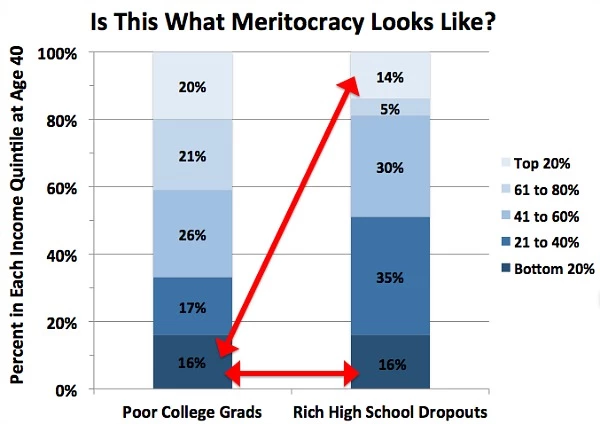 But this does not explain the full picture of social immobility [emphasis added]. 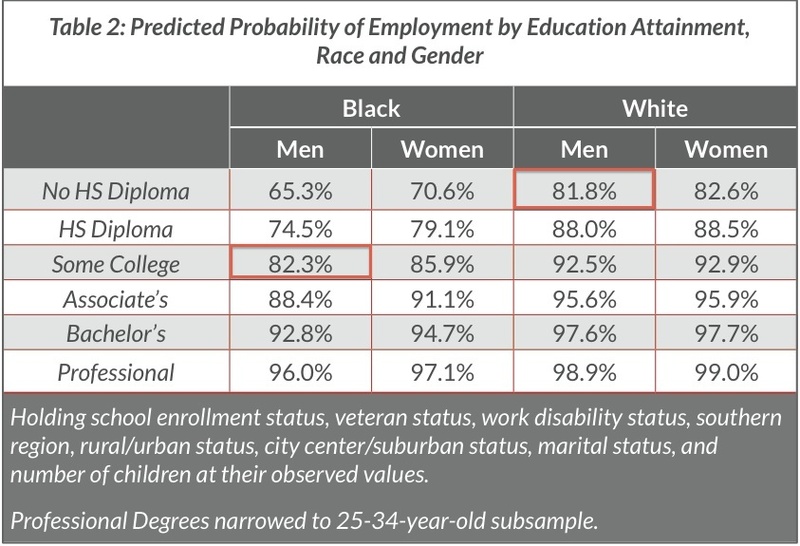 The impact of education (school and teacher quality), then, when placed in the context of both social class and race refutes the opening claims: (i) education is the single most important lever for lifting anyone above the circumstances of her/his birth, and (ii) teacher quality is the single greatest factor in whether that educational experience accomplishes the first belief. First, making claims that measurable education and teacher impact exists is problematic. Thus, I absolutely support that both education and teachers matter, but I also caution that this impact is not singular, direct, or easily quantified. Part of that problem is that the impact of any person’s education or the influence of any teacher or teachers tends to occur over long periods of time, and we are hard pressed to tease out and measure specific teachers or practices since that impact is cumulative, interrelated, and multi-faceted (consider that a student can learn a valuable lesson from a flawed lesson or a weak teacher). Our first conclusion, then, is that making claims about education being the single or sole factor in success or that the teacher is the single most important factor in achievement is misleading, overly simplistic. But, there are fair and accurate claims we can make about the importance of education, leading to our second conclusion. Our second conclusion is that within social class and race, educational attainment has significant influence, but that education alone appears less effective in overcoming large social inequities such as classism and racism. Media, public, and political hyperbole about education and teacher impact does a disservice to public education, teachers, students, and the public. Overstating the impact of education and teachers assures that we will continue to fail our students and the promise of universal public education. In our endless quest for education reform, we would be better served if we moved away from mostly measurable data points for making claims about and policies in education. Education is messy and complicated; quantified data are in fact simplistic and misleading. Until we confront the corrosive influence of class and race in the U.S. and until we admit that education alone is not enough to overcome classism and racism, we are perpetuating social inequity. Let’s be clear: Education and teachers matter. But, regretfully, they simply do not matter in the ways most people claim or believe, and certainly not in ways that are easy to identify. The good news, however, is that there is much we can do to change this, if we have the resolve to confront the evidence, accept the ugly truths, and then to do something different. This post is in debt to my current, fall 2014 EDU 111 course at Furman University, a group of students fully committed to engaging with the topics, challenging claims, and seeking to understand the complexity of education. They are proof that teaching is an act of learning, if the teacher is there to listen as well as talk. Reblogged this on Flexibility Enables Learning. I agree that the language we use sounds like blame, and all the attention on the “Vocabulary Gap” sounds like a deficit approach. But there IS a vocabulary gap. It’s just a HUGE variable, a predictor of everything from a child’s reading comprehension to their overall achievement. So we use this to info to convince teachers that if they are NOT teaching vocabulary explicitly and implicitly in everything they do, they’re doing a disservice. To HIDE the gap would be a bigger disservice. It’s a FACT, like poor people have less money. Or poor children are more likely to be obese. (and therefore we must not cut phys ed programs, and we must serve better food in schools!) It’s the fact that there is a gap that gives us the basis for demanding funds to ” provide books for children in their homes.” I’ve given many workshops to families on ways to engage with their kids around books, with homemade puppets, in the super market, on the cross town bus. On some level I feel uncomfortable, judgmental, like, “Please talk to your kids the way I talked to mine.” But…there is a difference in the amount of discourse from one home to another, and socioeconomic factors do predict them. How would you refer to the vocabulary gap? How would you have us argue for funds and policies without describing the problem we want to address.